The extra effort you put into getting regular checkups for your baby pays off later on. 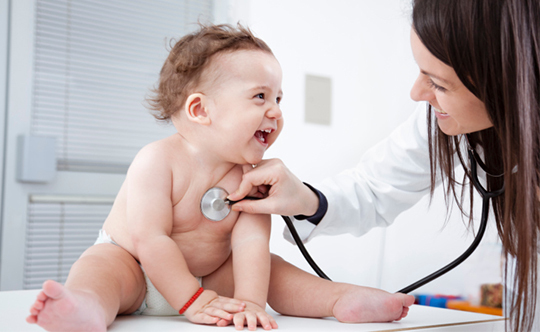 Your child quickly learns to be comfortable with seeing the doctor at an early age, while you learn the medical facts on how to keep your child safe and healthy. Pick a time when you and the doctor are available, and when your baby is well-rested and well-fed. That way, he won’t get upset or fussy during check-up. If possible, go during the doctor’s non-peak visiting hours, so you and your baby won’t have to wait in line for too long. If that’s not possible, bring extra food and drink for yourself and the baby, in case either of you get hungry. Tell the doctor and her staff how much time you think you might need with them, so they’ll know how to schedule your appointment. This is particularly important when your baby has a health issue you need to discuss at length with the pediatrician. If the purpose of your doctor’s visit includes addressing a certain health problem your baby had or still has, bring all the information (photos, videos, medical prescriptions, previous notes, etc.) along with you. The pediatrician will find them useful. Bring a notebook and pen as well, to note down everything that the pediatrician will say during the check-up. Both you and the doctor will need such notes for the next visit. Babies tend to fuss when clothes are too fussy, or require their heads or limbs to shoot through tight collars or sleeves. So keep your baby’s clothes (and shoes) simple and easy to remove or re-attach. Your baby may not like the strange but harmless tools the pediatrician might use during her check-up (i.e., stethoscope, weighing scale). If your baby is the nervous type, you can keep her in your lap or arms as the doctor performs the examination. Lovingly reassure your child throughout the entire process, to keep her calm. Pay attention to what the pediatrician is doing. If the pediatrician asks questions about your child’s health, answer them accurately, descriptively, and to-the-point. And above all, be honest about your baby’s health. dont’t be afraid to ask questions of your own pertaining to your child’s health (you have a right to ask and be given proper answers). Ask them in the same manner you answer the doctor’s questions. Some of the good questions to ask are: “Is my child’s health and growth normal?” “Are her immunizations appropriate and up-to-date?” “What possible changes or challenges should I expect for my baby over the next few months?” Note down whatever the doctor says or advises for your baby.